Góð heimilisvél með drifi fyrir minni og meðalgarða. Stiga Collector 46 SB er létt og meðfærileg heimilisvél. Vélin er með drifi og B&S 148cc úrvalsmótor. Sláttubreidd vélar er 45cm og hæðin er hækkanleg í einu handfangi. Collector 46 SB vélin er með legum í öllum hjólum. Er þægileg í notkun og fylgir vel grasfletinum í slætti. The Collector 46 SB is the perfect introductory lawnmower with a Briggs & Stratton 3.5 HP engine for owners of up to medium size gardens. You can either collect the clippings with the 55 litre grass collector, with its conveniently attached handle for rapid emptying or you can remove long grass quickly through the rear discharge, without the collector. 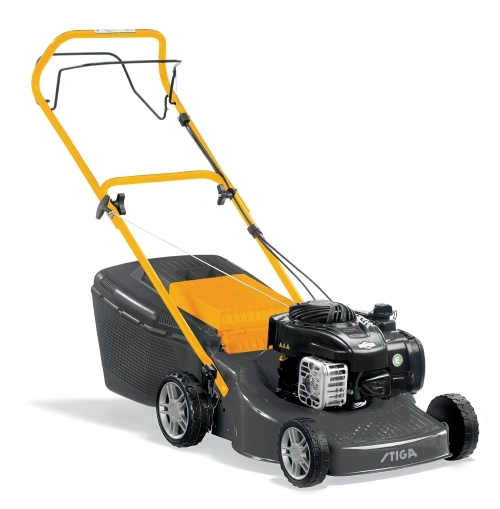 In either case, you can get your lawn quickly into shape. It also has a galvanized steel chassis, a 5-stage cutting height adjustment 27-80mm.